On January 10th, at 1:20 PM, Simi Valley Police Officers responded to the 200 block of Ulysses Street when a resident found a man in his home. The officers arrived at the location and the man fled the scene and eventually ran into another house in the area. When confronted by the resident of this home he again ran and tried to hide in the neighborhood. A perimeter was established and the suspect, who was identified as 21-year-old Simi Valley resident Manuel Delossantos, was eventually apprehended. Investigation revealed that Delossantos was related to a resident who was renting a room at the Ulysses house. He ran when he saw the police because he knew that he was wanted for an outstanding felony arrest warrant. In addition, while running from the house he discarded illegal drugs and related paraphernalia. 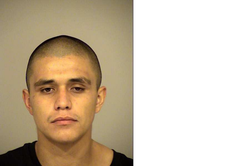 He was booked at the Ventura County Jail for the warrant and burglary for entering the second house, as well as misdemeanor drug and evading charges.